XL Delete - A powerful secure delete tool. 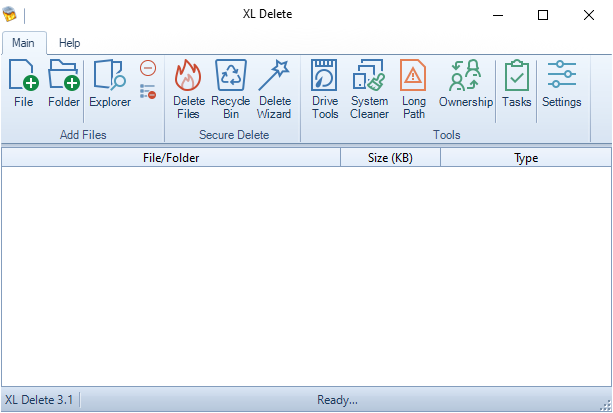 XL Delete is a powerful secure delete tool that will permanently delete sensitive and private files. 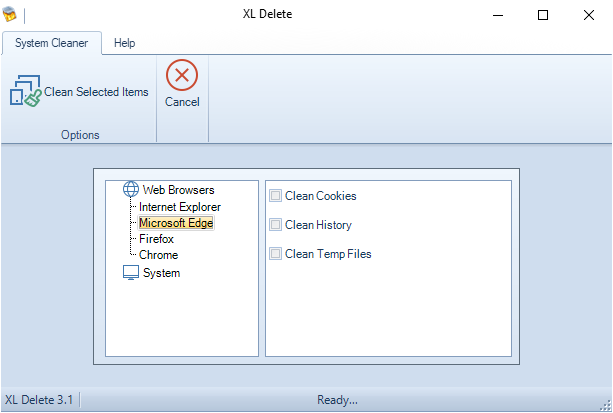 XL Delete can permanently remove any file, entire folders, and even Internet cookies, history, and cache files. Anything you delete with XL Delete cannot be retrieved using file recovery software. Free 15-day trial for Windows 10/8/7/Vista. Many people believe that emptying the recycle bin will delete a file forever. This belief is not true. 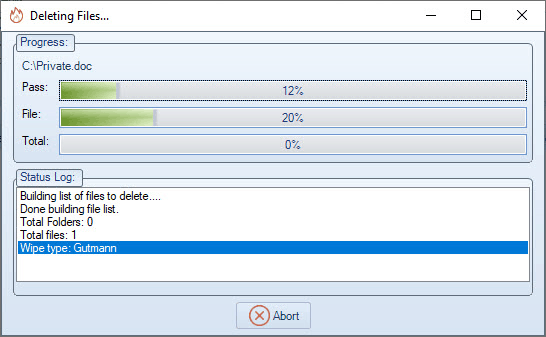 Removing a file without using a secure delete tool will leave all the file data on the hard drive. Windows will just mark the area where the file is on the hard drive as overwriteable so that it can reuse the space when necessary. Special data recovery software can search for the data and able to undelete the file to view all of the original contents. Use XL Delete to remove all files and prevent hackers and identity thieves from going through deleted files and finding passwords, credit card numbers, and other private information. When you delete a file with XL Delete, the file data will be overwritten several times using specialized methods to prevent data recovery software from being able to undelete the file. XL Delete will also incorporate several obfuscation techniques to hide the original file name and file size from data recovery software. Securely delete any file on your PC. Protect your privacy by making sure files you delete can not be recovered. Permanently removes old deleted files from your hard drive. Clean Internet Explorer, Edge, Firefox, and Chrome history, cookies, and temp files. Prevent identity thieves from retrieving personal information from your computer. Clean your old PC or laptop before donating or selling them. Lock extra free space on your hard drive to prevent fragmentation. Built-in file explorer helps you quickly locate the files that you want to delete. 12 Different wipe methods to choose from including Peter Gutmann's method. Easy to use wizard tool. Delete any file or folder in 3 simple steps. Shell integration, including integration with the Recycle Bin. Ability to wipe all the free space of any selected hard drive. Ability to purge old file names from any selected hard drive. Ability to securely lock the free space of any selected hard drive. Long path tool allows you to quickly remove files and folders with path names that are too long for Windows. An integrated scheduler that allows you to schedule the secure wiping of files and folders. Compatible with memory cards, USB drives, and other types of removable media. Use the Long Path tool to remove stubborn files with names that are too long for Windows to delete. Drag and drop support for files and folders. Cryptographically secure random number generator for maximum protection. Ability to force wipe non-system files that are in use. Integrated file viewer lets you inspect a file before deleting it. 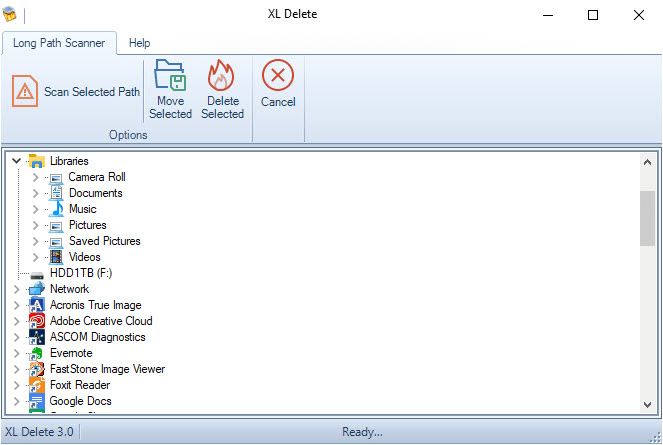 Unlike other secure delete tools, the XL Delete engine goes beyond just overwriting a file. It offers security, speed, and flexibility. The secure delete engine uses the same technology used in many cryptography programs to generate the data to overwrite a file. 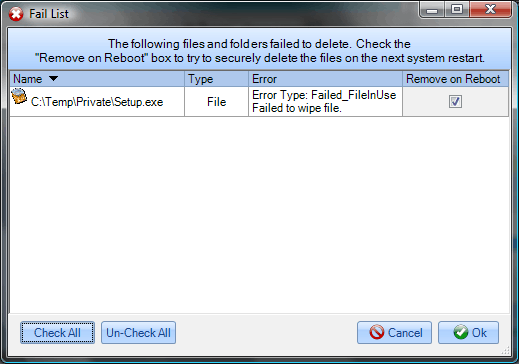 Prevents any patterns from forming and offers increased security against file recovery software. The engine will also go beyond just wiping the file data and obfuscate the original file name to prevent recovery software from ever finding the name. Advanced buffer detection dynamically optimizes the engine settings for each file. Allows the engine to securely delete files with the best possible settings resulting in quicker deletes. It features 12 built-in secure delete wipe methods and gives you the ability to define custom wipe methods. Securely clean all the free space on hard drives or other removable drives. This option will prevent any files previously deleted from being recovered, even ones removed without a secure delete tool. Remove any old and unwanted file names from the hard drive's file table. Many of our competitors' tools leave this information behind which allow data recovery tools to get the file names of old deleted files. XL Delete can prevent this by purging all old file names from the file table. Securely wipe Internet cookies, history, temporary browser files, temporary system files, and temporary user files. Hide all of your Internet tracks and prevent anyone from knowing what sites you have visited and what files you have downloaded. Currently supports Internet Explorer, Edge, Mozilla Firefox, and Google Chrome browsers. Use the task scheduler to keep your PC clean at all times. You can schedule wiping files, folders, the free space of any drive, Internet tracks, and the recycle bin. The shutdown tasks will ask you for permission to run whenever you shutdown or restart the computer. Don't just empty the recycle bin. File recovery software can get those files back! The recycle bin leaves all the file data behind. XL Delete can securely wipe all the files in the recycle bin and prevent file recovery software from getting your data back. Do you have lots of extra free space on the hard drive? XL Delete can securely lock the space on the hard drive and prevent Windows from writing any data to it. Helps keep the hard drive clean of unwanted files. You can unlock some of the space as needed. 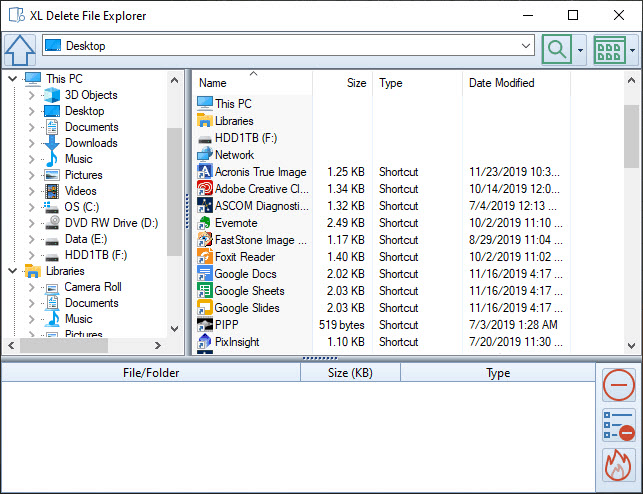 Built-in filter enabled Windows Explorer-like view makes it easy to find files and folders. XL Delete makes it easy for you to remove files or folders. Just drag any file or folder into the File/Folder list to add for deletion. 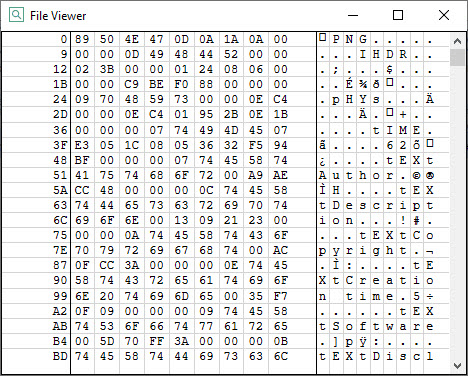 The integrated file viewer allows you to view the binary data of any file before you delete it in a hex viewer like display. Networked files, folders, and drives can all be wiped using XL Delete. 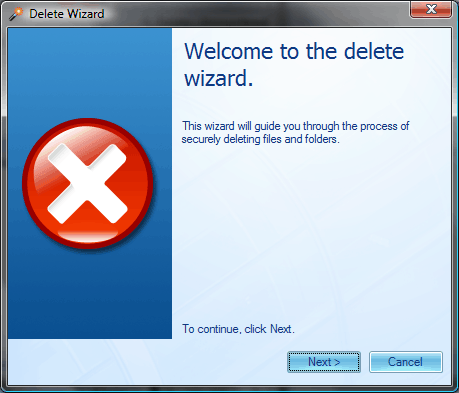 The simple wizard can guide you through the process of securely deleting any file or folder. Allows anyone, regardless of experience, to use XL Delete. 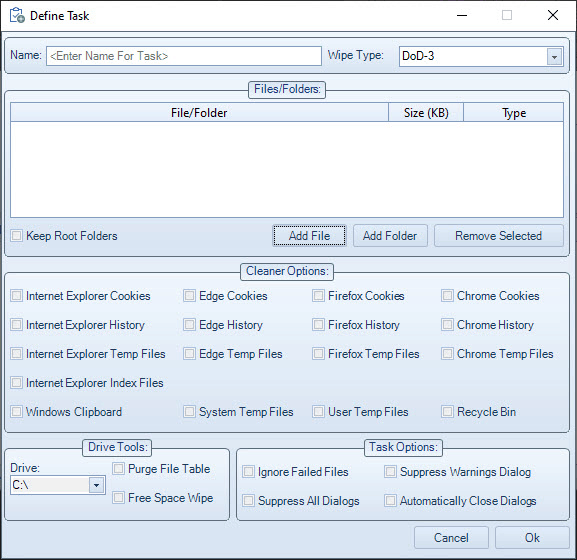 The explorer integration will allow you to quickly securely delete a file or folder with XL Delete by right-clicking in Windows Explorer and choosing Remove With XL Delete.